JDW Joinery is a Certified Corian® Fabricator. Our highly trained fabrication and fitting teams can bring your initial ideas into reality. We offer unique handmade, visually beautifully crafted products for your kitchen or bathroom. Our service is built on a platform of quality and rigorous attention to detail, this is how we achieve the quality of our solid surface products that stand out from the pack. We use the combination of machine and handcrafted finishing techniques allowing us to produce a product that has exquisite profiles, together with exemplary finishes. Corian® is an advanced composite of natural minerals and pure acrylic polymer, which is backed by DuPont™ with a 10-year Limited Installed Warranty. With an extensive range of colours, Corian® can be worked, shaped and blended into a boundless variety of forms and colour. Created to last a lifetime, its unique blend of natural minerals and acrylic creates a stone-hard surface that can be shaped to meet any design or dimension. The inherent resilience of Corian® comes from the fine qualities of minerals and acrylics. It’s a non-porous surface and prevents dirt and stains from penetrating the material. Marks and stains stay on the surface and can easily be removed with a Scotchbrite® pad and household cleaner. 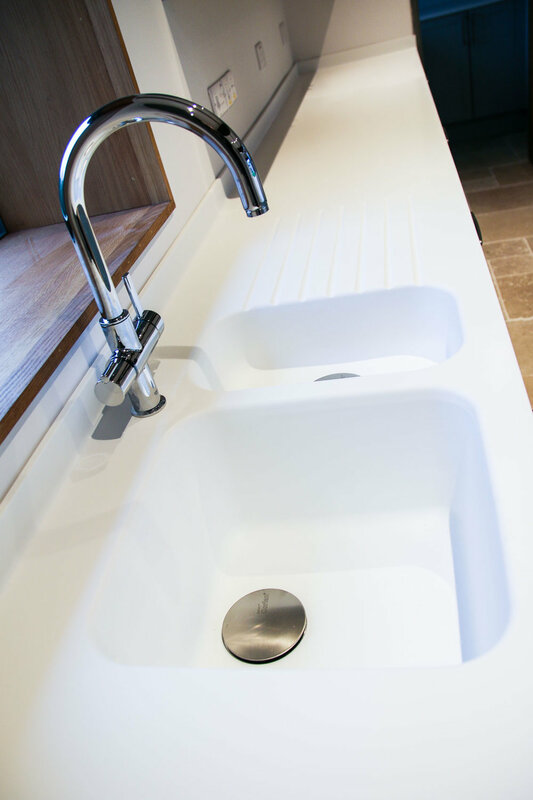 Corian® is exceptionally resistant to high temperatures, even cigarette burns or marks left by boiling hot pans are only superficial and can be quickly removed. Heavy stains and scratches can be erased without a trace simply by rubbing with household cleaner. Just a little effort will soon return the surface back to pristine condition. Corian® is solid and homogeneous, colours and patterns run all the way through and cannot wear off, it has been developed for one purpose; to create a practical material for living. Since its introduction in 1967 Corian® has proven itself to be remarkably durable and versatile making it easy to live within both domestic and commercial environments. Corian® cannot delaminate which means that joints are inconspicuous and fluids cannot penetrate. Originally supplied to us in sheets and shapes, Corian® can be fabricated with conventional woodworking tools into virtually any design imaginable. Corian® solid surface worktops are hygienic, it is non-porous and Its smooth surface does not allow liquids to penetrate which makes it easy to clean. Bacteria and mould have nowhere to take root. When Corian® looks clean, it really is clean! Corian® keeps its good looks over time, it is hard-wearing and survives the impact nicks and cuts that can occur with daily wear and tear. Corian® surfaces are renewable, damages can usually be repaired with ordinary abrasive cleaners and a scouring pad. Renewability and durability make Corian® inherently environmentally friendly. Corian® is an inert, non-toxic, chemically unreactive, hypoallergenic material. At normal room temperature, no gasses are given off from Corian®. Even when exposed to direct flame, Corian® is one of the least toxic materials available. This means that Corian® can be used for sensitive applications such as museum archival storage and display cases, also for wall and work surfaces in hospital operating rooms and intensive care facilities, it is truly a leader within sensitive environments.